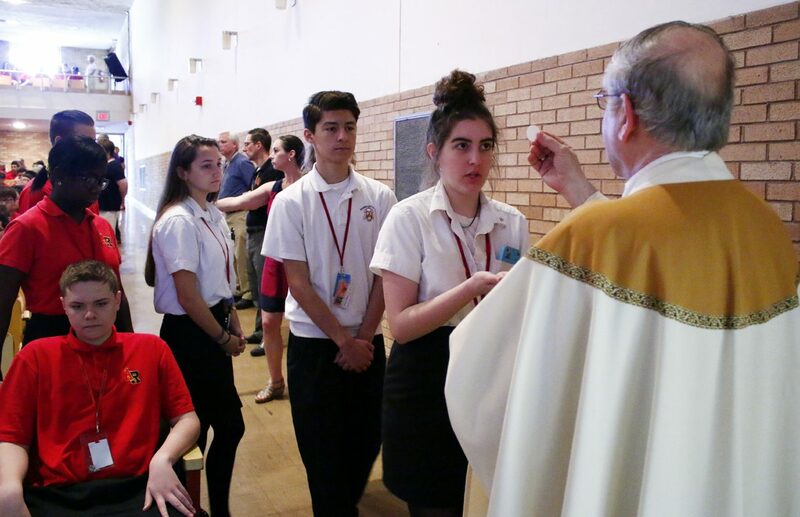 Archbishop Charles Chaput visited Archbishop Ryan Catholic High School in Northeast Philadelphia on Friday, May 19 to celebrate Mass for the closing of the school’s 50th anniversary year. Named for Archbishop Patrick J. Ryan, Philadelphia’s sixth bishop and founder of Philadelphia’s Catholic secondary school system, the high school remains the largest in the archdiocesan system with 1,255 students. That number is somewhat smaller than in its early years when Philadelphia’s Catholic schools were free. At its foundation it was co-institutional with boys and girls occupying separate wings, divided by the auditorium and chapel with separate entrances. It is now fully coeducational with the Raiders and Ragdolls sitting side by side in all of the classrooms. Also, the early faculty consisting of Franciscan friars and religious sisters have been largely replaced by equally dedicated lay teachers and administrators. Today there are probably more students of other faiths at Ryan than at its foundation. There is also a large contingent of international students; the majority of these are visitors from China, but also Korea and some European countries. One thing has not changed, and that is the Catholic identity that is ever present. This was made clear during Archbishop Chaput’s homily. A theology teacher during his early career, he chose a question-and-answer commentary format using student volunteers. 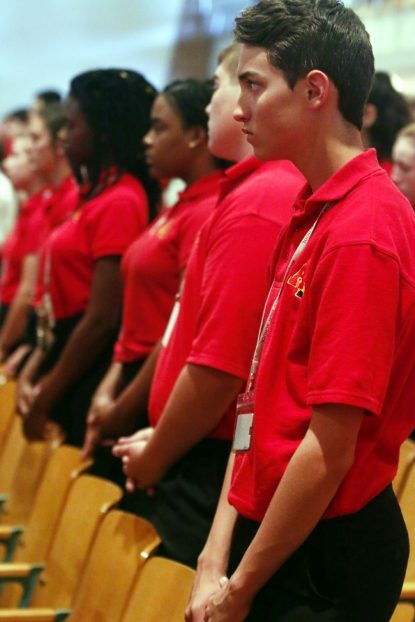 “Christian education is important in all of our lives,” the archbishop agreed. Kaitlyn Dona, a senior, explained why her school is important to her. She came from a small grade school but found that at Ryan, even though there are more than a thousand students, no one in the school is left out. “The academics are great, the religion is great and I feel more than ready as I prepare for college,” she said. Certainly Ryan has changed over the past five decades, and the world itself has changed culturally, Ryan President Denise LaPera noted in her brief remarks. Even with all of the changes there is a sense of continuity with a number of the faculty virtually spending their entire career at the school, most notably Franciscan Father Rene Barczak who is retiring after 50 years, mostly at Ryan, and recently as alumni director. Principal Joseph McFadden himself is among the 35,000 graduates of Ryan. He sat in the classrooms just two decades ago, graduating in 1997. The constant, he said, has been Catholic identity, strong academics and strong extracurricular activities. The electives include courses unimagined in past generations, for example informational technology/e-commerce, forensic science, computer aided drafting, entrepreneurship/virtual business, 3D design and digital literacy. Among the non-electives, what stands out is the number of languages offered — French, Italian, Spanish and Latin — something not possible in smaller schools. Ed Bell, the assistant principal for student affairs and a permanent deacon at nearby Our Lady of Calvary Parish, is a 1986 grad. In his day, the transition to coeducation had not yet taken place. The only class the boys could attend on the girls’ side was home economics, but they called it survival skills. Most boys who took it were football players. “They just wanted to meet girls,” Bell suggested. Although there are still a few religious sisters on the faculty, Father Rene was the last Franciscan. But now the lay faculty, he believes, are carrying on the tradition of caring for the students.